We’ve touched on exterior colors in previous blog posts but thought we’d expand on that as we hear a lot of interest from customers. There are many things to think about when deciding to paint the outside of your house. One of the first things to ask yourself is how long you will likely remain in the house. Some people like to make an artistic expression or statement of their own style. However, most of us want to create an appealing look that will improve the appearance of the home in the eyes of the most people and maximize the home’s sales value, even if you have no intention of selling for a few years. That usually means you should strongly consider neutrals. Today’s neutrals you’ll find include many shades of gray and blue to blend with the trends we’ve been seeing in interiors the last few years. The Baltimore real estate market is booming, so to help sell your home fast you want to play it safe. 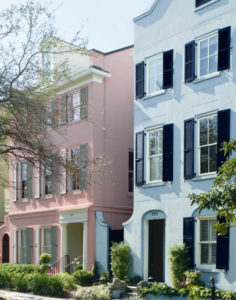 Unless you live in a row house where playful color is more abundant. Start by looking around your neighborhood to see which houses look great to you. You will want to stay within broad norms in the area. While you don’t want to use the exact color of the houses on either side of yours, you don’t want to be so different that your house is the proverbial sore thumb. A good way to get started is to look through photos of exteriors on design web sites such as Houzz, and be sure to search Google “images” of house exteriors. Design magazines such as Southern Living, and House Beautiful have good ideas. Make sure you are looking at a 2018 version so you are not out of date before even getting started! And of course, check Benjamin Moore sites  and come in to look at our brochures and idea pamphlets, and talk with our experts at either or Timonium or Fells Point locations. You’ll want to consider the architectural style of your house and popular or traditional color schemes for that style. Baltimore has a great variety of historic and more modern styles from colonial, Victorian, craftsman, shotgun and our own delightful row house variations. In looking for ideas like this, you’ll find many samples of color schemes using 4 and 5 or more different colors for door, walls, roof peaks, windows, shutters and trim for example. Consumer Reports recommends not trying this unless you are working with a professional designer, otherwise stick with two colors or perhaps 3. Many homes have stone or brick in certain areas or entire walls like here in Fells Point. Other fixed colors may be your visible roof, or flowering trees and landscaping, walkways, metal grids and fencing that you’ll need to consider. Of course you’ll want quality paint that will last for years, standing up to the four seasons of weather here in our coastal area. 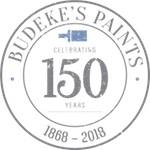 We have been advising homeowners and businesses in Baltimore for 150 years. We can advise you on all the issues above, and 101 other issues we haven’t even mentioned. We’ll show you the right paint to use, the best tools, how to prepare and apply it or how to find the right professionals to take on your project. 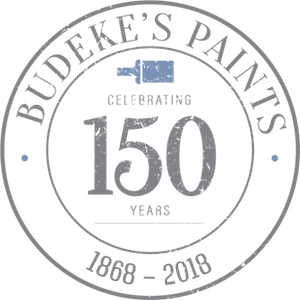 Copyright © 2018, Budeke's Paints & Decorating. All rights reserved.